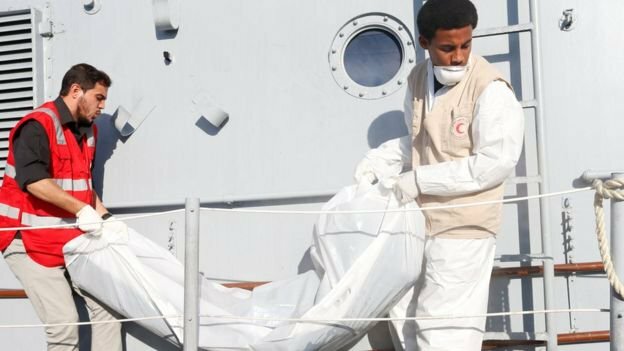 The UN migration agency has raised the probable death toll to 64 in the weekend sinking of a smugglers’ rubber dinghy in the Mediterranean Sea off Libya. The Italian coast guard, hours after the boat started sinking Saturday due to a puncture, rescued 86 people from it and retrieved the bodies of eight dead women. Flavio Di Giacomo of the International Organization for Migration says Monday that according to survivors, interviewed by the agency in Catania, Sicily, after they arrived on a rescue ship, there were 150 persons aboard the overcrowded rubber dinghy went it took off from Libya. Rescue agencies had expressed fears shortly after the tragedy that dozens could be missing. The Italian coast guard launched a search but didn’t find any more survivors or bodies.